Following in the footsteps of Building Equality in Architecture Toronto (BEAT), BEA Atlantic was publicly launched at the 2017 RAIC Festival in Saint John, New Brunswick by a team of dedicated architects and designers under the support and guidance of established architectural practitioners and BEAT founders. BEAT is an independent organization dedicated to supporting equality and diversity in the profession of Architecture through advocacy, community engagement, supporting minorities in Architecture and professional development. We create events and web content to promote the advancement of women in the profession, and provide mentorship, networking and leadership opportunities. 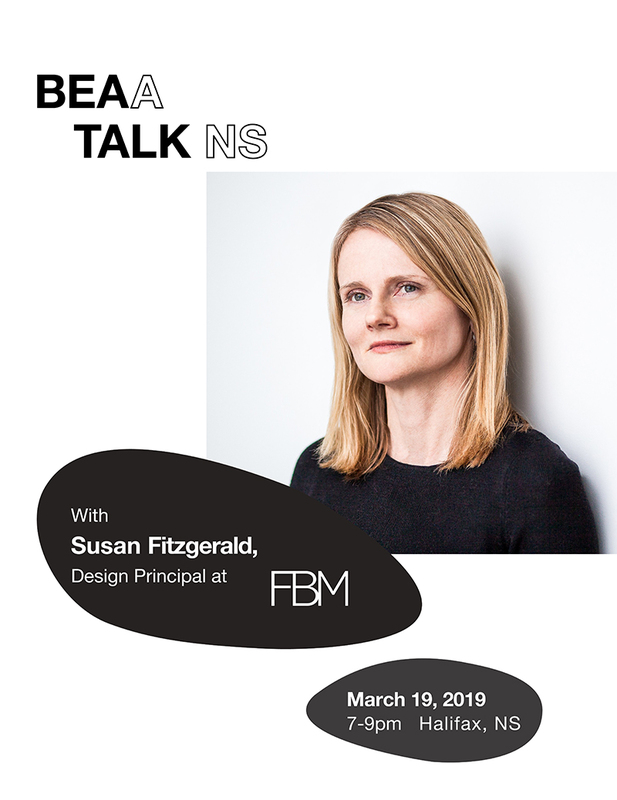 This month features award winning architect and design principal at FBM Architecture | Interior Design, Susan Fitzgerald, speaking on how in e​very local context, a unique ecosystem is at play that is constantly evolving. Climate, culture, politics, demographics, economics, and ingenuity all contribute to the uniqueness of what happens (or does not happen) in a place. Focusing on research in Havana, Cuba and her own recent projects in Halifax, Nova Scotia, Susan will discuss the life engendered within and in-between architecture and how it might encourage diversity and resilience. Doors open at 7pm for networking. Light refreshments will be provided by FBM. BEAA​ | Talks are a series of round-table discussions held at the offices of varying Architects across the region and provide a platform for promoting equality within the profession, through networking and leadership opportunities. The host speaker will share their learned experience that will include subjects pertaining to Practice Management, Project Management, Architectural Culture, Risk Management or the Legal Issues and Legislation related to Architectural Practice and the Construction Industry. Due to limited seating, we ask that you reserve a ticket in advance to ensure your spot. BEAA Talks qualifies for 1 continuing education credit. Originally from England, Susan Fitzgerald is an architect, interior designer and Assistant Professor of Practice at Dalhousie University. Her work, with FBM and independently with Susan Fitzgerald Architecture, has been the recipient of many accolades—including the Canada Council for the Arts, Professional Prix de Rome, Governor General Medal, the Wood Design Award, the EnRoute Air Canada Award in partnership with the RAIC, Maritime Design Awards, and multiple Lieutenant Governors’ Awards including the Medal of Excellence. In addition, the work has been nominated for the ArchitizerA+ award and Mies’ Crown Hall Americas Prizes (IIT College of Architecture) for the best work in the Americas. Widely exhibited and published, her specific approach to practice was showcased in Elke Krasny’s international exhibition ‘Thinking out Loud: The Making of Architecture’. Susan was made a fellow of the RAIC in 2015. Over the last 100 years of architectural practice, FBM has dedicated themselves to creating buildings that enhance the quality of life within them, and the communities they serve. We call this ‘people-driven design’. Based in Halifax, we are one of Atlantic Canada’s most recognized firms consistently creating architecture and urban environments that are powerful, creative, and elegant. While our portfolio contains a wide range of projects and building types, it is united by shared values: we design spaces that feel good; details matter in all aspects of our work; and our designs always strive to build community.